Hollywood screenwriter Drew Pearce’s directorial debut takes place in 2028 Los Angeles where there are riots in the streets over a water crisis. That's not really important to the story except that it puts everything on edge as criminals must make their way through the chaos to their subscription health care center that only caters to bad guys. Everyone must follow the rules, and only members are allowed to have gunshots and knife wounds tended under code names based on their themed rooms, like Honolulu, Waikiki, Nice, Acapulco and Niagara. The posh Art Nouveau hotel had seen better days, but now only uses the penthouse floor to house it's robotic medical facility. The Nurse (Jodi Foster) has her hands full at the moment with a beautiful French assassin (Sofia Boutella) and a complaining arms dealer (Charlie Day). They are joined by Sterling K Brown, a thief, whose young brother (Brian Tyree Henry) was shot during a bank robbery. He's been trying to get out of the life, but his brother talked him into this job. Good thing he didn't stop paying his premiums. 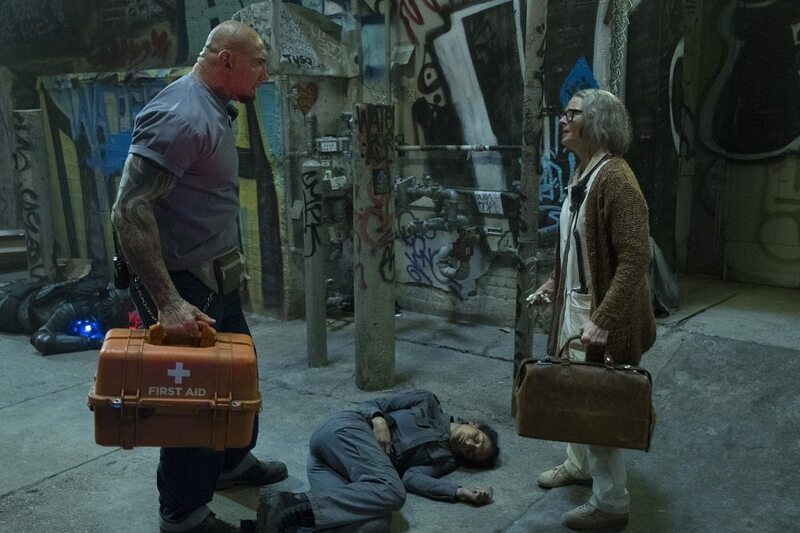 Nurse is assisted by Dave Bautista who plays Everest. He is quick to remind people to read his badge as he's a licensed medical assistant. He also makes repairs and hauls off unwanted clients and enforcing the rules of the hotel. The night becomes more complicated when the owner "The Wolf King" (Jeff Goldblum) is 50 minutes out as his son Crosby Franklin (Zachary Quinto) and his thugs seal the doors to the hotel to insure the safety of his father. Complicating things, an injured female cop is at one of the doors seeking help. She knows The Nurse's real name and the reason why Nurse never leaves the building. But helping her is breaking a major rule of the hotel. The film is only 97 fast paced minutes. The dialogue is funny and the action is extreme and satisfying. Hotel lives in the same kind of alternative universe as the Hotel Continental that caters to assassins, only not as plush and civilized. Hotel Artemis has high tech equipment that can operated and created 3D body parts to replace injured ones. The Nurse only has to push the right buttons and go check her other patients. It's great to see Jodie Foster back on the big screen as the Nurse who has a unique shuffle/runs with her big medical bag, badgering her patients and administering heavy duty elephant tranquilizers. It's a nice mindless romp and worth the popcorn.